Our smallest child loves to go sledding. A mere dusting of snow sends him running for the closest, unoccupied sled. He bombs—head-first—down our driveway, the snowbanks created by our plow guys, the steep incline near our house which I worry is rife with sapling stumps. 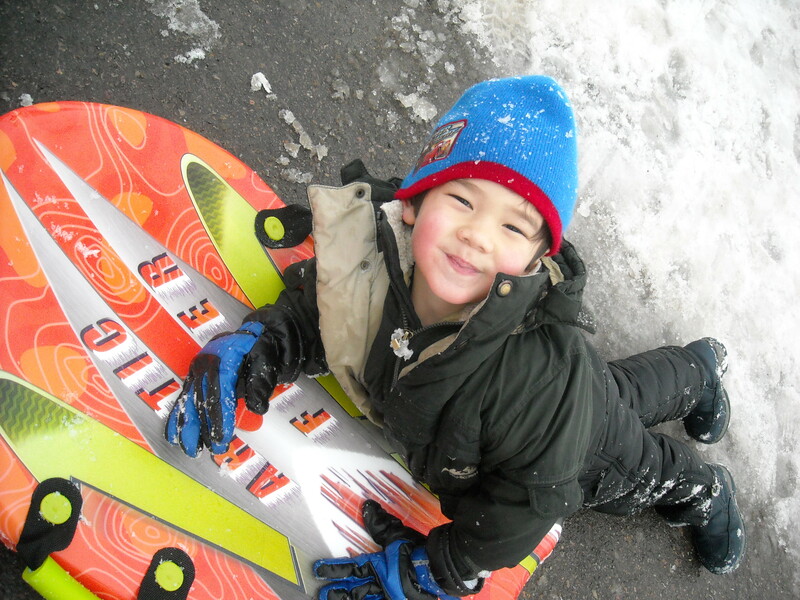 But his all-time favorite place to go sledding is the hill behind his pre-school. Growing up in the frozen tundra of the northeast corner of Vermont, I am no stranger to sledding. My childhood home was perched at the top of a hill just off a narrow dirt path the town considered a road. Since our road was a low priority for the town plow, my sister and I were sometimes able to pretend it was a bobsled or luge run, depending on its’ condition. It took about a minute for us, perched upon thin sheets of molded plastic, to zip down to our next-door neighbor’s house, a quarter of a mile away. Henry’s hill is tame compared to these frighteningly unsafe memories of mine, but he is just as thrilled as I was by the bitingly cold air, the way the treeline blurs, by that rush of adrenaline that comes when the sled reaches maximum speed. We had promised to take the kids sledding at Henry’s pre-school over the weekend. It was my understanding that this was one of the “perks” of our private school. However, when we pulled into the parking lot, we found what looked to be a used car dealership. Automobiles were parked bumper to bumper. A quick scan of the hill revealed masses of children and adults. My husband and I looked at each other. He threw the van into reverse and we backed up almost into the main road. We pulled forward into the lot and wedged our vehicle between the dumpster and a well-loved Volvo. Henry stopped crying. Nora started whimpering. I’ve mentioned that our middle child does not like surprises. She also has an aversion to crowds. “I’m staying right here,” she announced. It took me ten minutes to convince Nora to release the death-grip she had on her car seat. My last attempt to ameliorate her anxiety was to assure her that we would avoid the crowd if we walked to the hill via the side of the school without a trail. The side of the school that has signs posted, “Danger! Falling ice.” I have to pick my battles with her and the standing seam roof was mostly ice-and-snow-free. “This is a birthday party? Oh, God, I didn’t realize. We came up the back way…” I scanned the hill for the rest of my family, thankful that 1) Liam was at a friend’s house and 2) The family we had invited to join us for an afternoon of sledding hadn’t been able to make it. “Oh, I think it’s alright,” my amiable husband said. “Not all these people can be here for the party and the kids are having fun. Let them take a few runs and then we’ll go.” I reluctantly agreed. A few runs turned into a few more runs, which turned into ‘just ten more minutes.’ By the end, Henry had made a new friend and was sharing his snow-tube. His wide grin told me he was having a blast. I started to relax. It’ll be alright, I told myself. As long as I don’t have to go down there and mingle with the party parents. It was then that I saw her: Nora was in the queue for hot chocolate and cake. Grabbing one of our sleds, I sped down the hill to prevent her from making our social faux pas worse. We left shortly thereafter. As we were leaving, a number of friendly parents and kids waved goodbye. This is probably how the White House crashers got their start.